Idli is supposed to be one of the healthiest breakfasts in the world. It is also the most popular one and my favourite among the South Indian breakfast items. 1. Soak the rice and dal separately for at least 4-5 hours. 2. Grind them separately adding a little water and salt to taste. 3. Mix everything together and let the dough ferment preferably overnight or until it is risen well. 4. Grease the idli moulds and pour the batter in each mould little less than the rim. Steam for 10-12 minutes. Remove the idlis and serve hot with chutney and Sambar. Right now its 11.15 am and I feel like having this plate for my brekky !!! 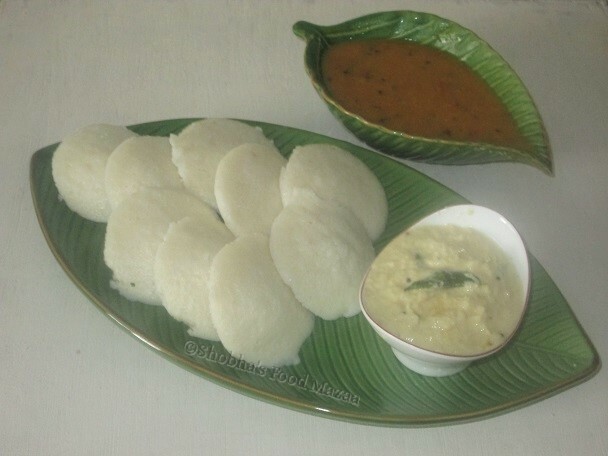 I love to have idli anytime of the day..
What is the difference between cooked rice and boiled rice and when do we need to add this? Alpa, boil rice is parboiled rice .. we have to add everything while grinding .. Absolutely agree with idli being one of the healthiest breakfast option. My recipe is quite similar to yours except I dont add any cooked rice and use soaked methi seeds for the soft idli texture. Great share. Ok.. I started adding them recently too. Idli is one dish I have never mastered. It's such a light but filling dish to have for breakfast. Your recipe makes it sound easy to make so I will save it to make soon. Your idli looks light and fluffy.I am going to try this recipe as I only make with the dhal and idli rice combination so will need to buy par boiled rice to try your recipe. Do try out and let me know how they turned out. Idli is certainly the most healthiest meal one can have. The idlis look so soft and melt in the mouth kind. I've try adding parboiled rice next time when I make the batter.